Fellow Tailgaters....we haven't posted much in a while but football season will be here before you know it! Its time to start some tailgate prep. Are you looking to purchase a new Tailgating Grill for the season? If so, you should check out the Margaritaville Tailgating Grill. 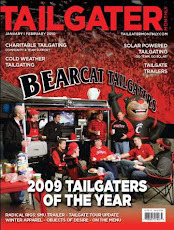 Our friends at http://www.tailgatingideas.com/ will show you how to customize your Margaritaville Tailgating Grill to a Red & Black Bearcat Tailgating Grill.